I love ferns -- all different kind of ferns and once we had the breakfast room with great quantities of light, ferns seemed easier to grow. This isn't really a log but a faux bois piece. I love faux bois and the French seem to do it so well. This is a planter but we also have a bird feeder in the garden. The faux bois that I truly covet is a concrete table. Alas, they are pricey and I'm afraid that there will never be one in the garden at Linderhof. Faux bois is French for false wood and that are what faux bois pieces are -- it looks like wood but it isn't wood! 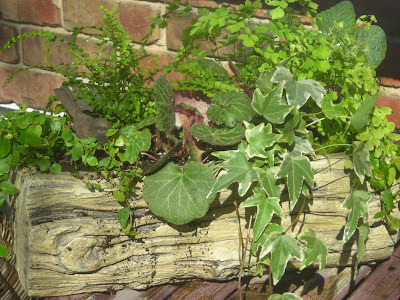 Like my new planter which appears to be a log. 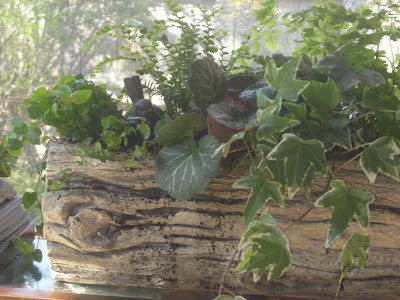 A table in the breakfast room is the perfect place for my faux bois planter filled with ferns, ivy, a begonia. 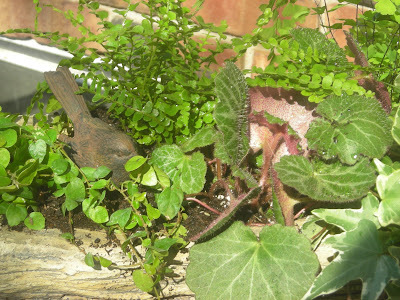 To keep all the greenery company, a perky little bird that looks like a wren. That looks a lot like the Carolina wrens that decided to visit the inside of Linderhof last fall! I guess if the planter is "faux bois", then the wren is a "faux bird"! 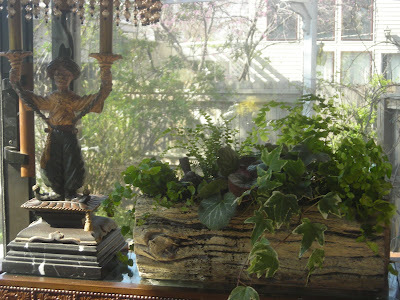 The planter, ferns and bird bring a bit of whimsy to the breakfast room. Very pretty planter! I too covet a faux bois table. Maybe a bench will be do-able. This morning I made your Espresso Coffee Cake and it disappeared very quickly with mid-morning coffee. Thank you! Glad you enjoyed the coffee cake. I love your Faux bois, adds a pretty whimsey to your room. Most of all I love your lamp, looks like a Genie. Love it. Love your planter! What a lovely piece to look at. I love ferns too, but I wasn't blessed with a greem thumb like you! If I don't get a chance to e.mail you I would like to wish you and your family a joyous Easter! What a wonderful planter, Martha! I will have to watch for something similar when I start to visit the garden centers this spring. I also am in love with ferns. Happy Easter and thank you for your comment! If you are really in love with ferrocement Faux Bois, take a look at the little art & craft website below. On it, you can learn how to make your own!